IoT is the way of connecting physical objects with IP address to the cloud or any other internet connected device around the world. Data collected from IoT devices can be useful in system monitoring and control in large scale. Consumer applications like smart home automation, elder people caring system. commercial applications like transportation, medical and health care application. Industrial applications like Manufacturing industries and agriculture. Infrastructure application like energy management and environment monitoring system. 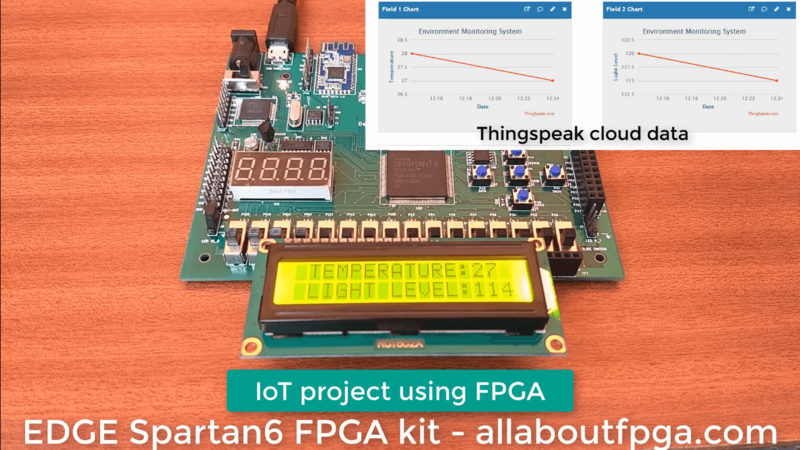 Some of the features of FPGA takes IoT to the next level. Parallel computing is the important feature of FPGA which can read the multiple sensor data at the same time and update it to the cloud continuously. Reconfigurable Hardware feature of FPGA benefits Internet of Things to be feature proof without any physical hardware modification. Low power consumption of FPGA helps IoT devices to be energy efficient as possible. All About FPGA brings you IoT ready EDGE FPGA Kits to the FPGA Community . IoT ready kit include EDGE Spartan 6 FPGA Kit and EDGE Artix 7 FPGA Kit. The EDGE Board features ESP WiFi modem and Bluetooth 4.0 BLE connected with FPGA and Analog interface along with Temperature and light detect sensors connected to ADC chip. 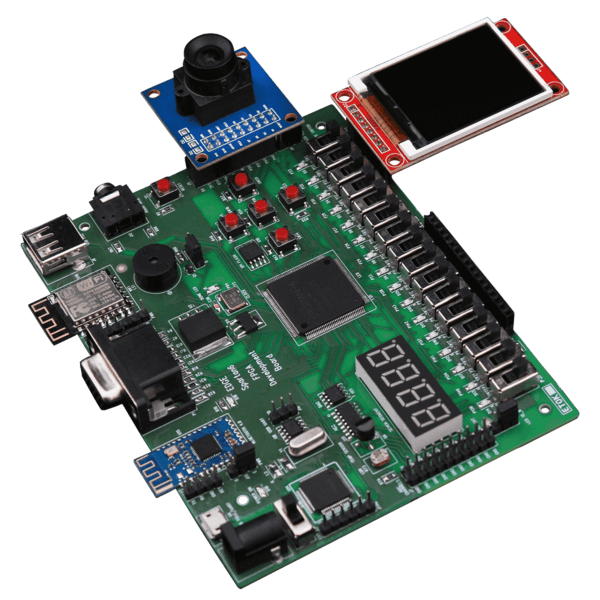 Spartan 6 FPGA kit features 8 channel ADC which can be used to interface up to 8 Analog sensors. 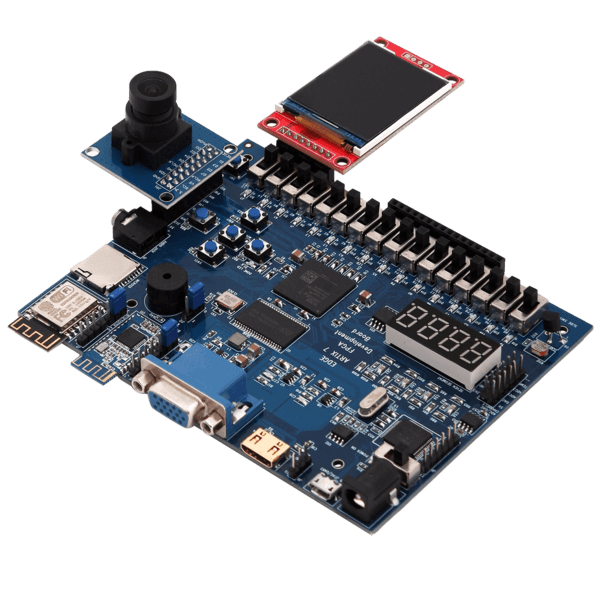 Artix 7 FPGA kit features 4 channel analog input available at the external connector which can process 1MSPS. 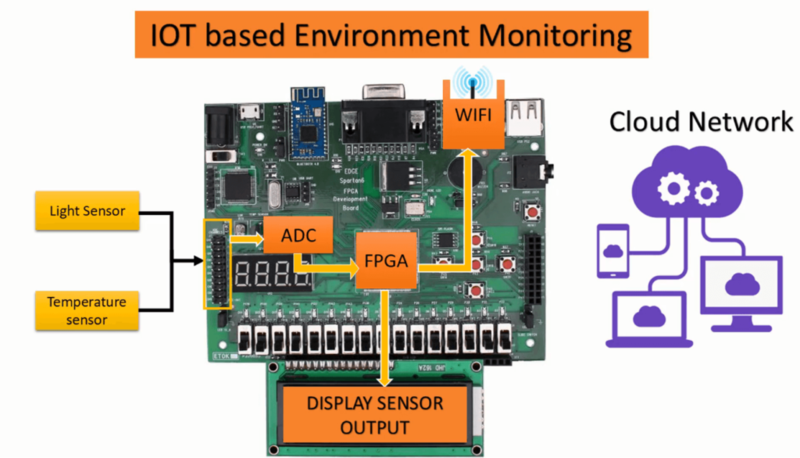 We have implemented Environment Monitoring System using EDGE FPGA Kit. Reading the temperature and light intensity level. Convertion of analog sensor data to digital output. Finally Sensor data is transmitted to the cloud network through WiFi modem. Cloud data can be eaily accessed through mobile App or PC through cloud network channel ID. Thingspeak cloud network is freely available for us to store and access data through API keys. Sensor data like temperature and light intensity can be easily visualised through graphs.